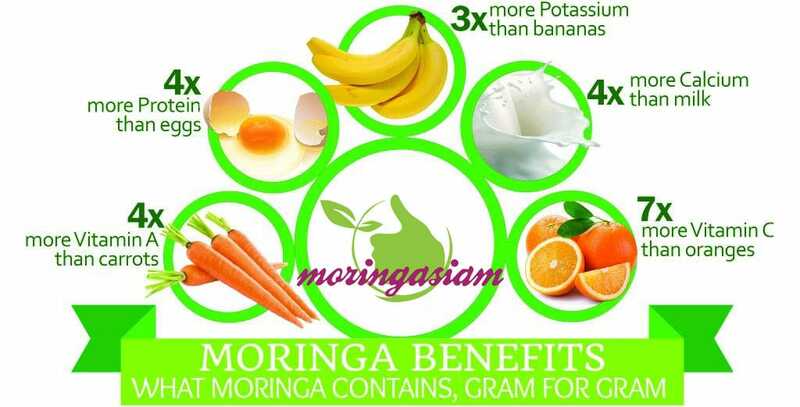 Why should you try Moringa ? To rapidly and significantly improve your immune defenses, there is nothing like a Moringa treatment that has been proven by numerous scientific studies to have positive effects on the body. Click here to discover our ready-to-use cure and start enjoying the benefits of the Tree of Life. Very easy to use, just eat 5 capsules a day. You will feel healthier and stronger against illnesses and infections. The high concentration of zinc in the seeds helps regulate insulin secretion, which regulates blood sugar levels and therefore helps fight diabetes. Too much cholesterol can lead to the risk of cardiovascular disease. The production of mono-saturated fatty acids, facilitated by Moringa seeds, is useful for the prevention of clots and heart disease. 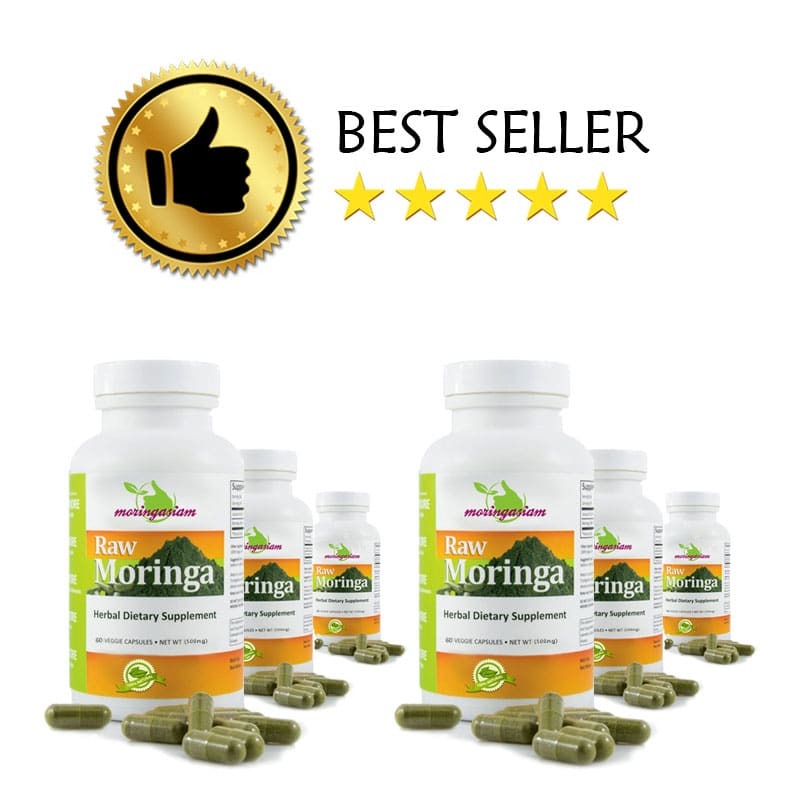 In order to benefit from these virtues, Moringasiam has elaborated a 100% natural Moringa seeds treatment that you can discover by clicking here. Whether you suffer from osteoarthritis or chronic rheumatism, joint pain, back pain or arthritis, you can benefit from the anti-inflammatory effects of Moringa very simply thanks to our ready-made treatment. 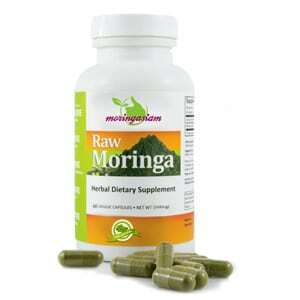 Moringa stimulates and strengthens the joints, especially with amino acids and proteins. Moringa’s vitamin C maintains the production of azotic oxide and thus contributes to healthy arteries. Potassium limits the amount of sodium in the body and helps regulate blood pressure. Magnesium, zinc and vitamin E also play an important role. Again, Moringa powder (raw or in capsules) is ideal to take care of your health by stabilizing your blood pressure. 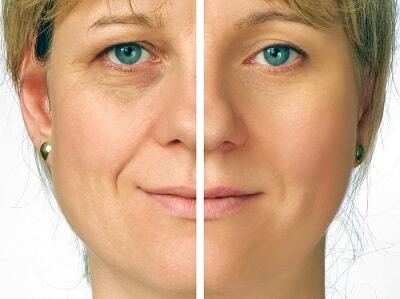 The well used Moringa is a very effective anti-ageing agent with proven results. Indeed, the tree of life accelerates cellular renewal and slows down the aging of the skin. Moringa oil acts as a collagen stabilizer and repairs damaged cells. It thus hinders the development of wrinkles and micro-wrinkles, and prevents the facial muscles from sagging. For blackheads and acne, it acts as a purifier and prevents their spread. And so many others ! And more than 300 others benefits ! In fact, traditional medicine uses Moringa to cure more than 300 diseases. Want to try ? shop your ready-to-use treatment today! To enjoy all the benefits of the tree of life, nothing could be easier ! At Moringasiam, we take care of everything. That’s why we’ve developed a 100% Natural Moringa treatment. All you need to do is eat 5 capsules a day during the chosen treatment period (1,3, or 6 months). We recommend 3 months or more to get the most out of the different benefits, but nothing prevents you from trying the tree of life and choosing the 1 month one ;)! How can a tree promise so many virtues? If a single tree can bring so many benefits, it is due to its very high content of ultra-beneficial nutrients for the organism. Moringa contains more than 92 nutrients! 46 antioxidants that fight against free radicals and thus prevent the degeneration of cells leading to diseases such as cancer. 36 natural anti-inflammatory drugs that improve joint health and relieve chronic or acute pain. 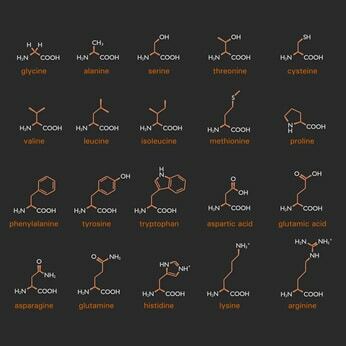 18 amino acids including the 9 essential ones. Vitamin A, vitamin B, vitamin B1, vitamin B2, vitamin B3, vitamin C, vitamin E.
Diseases or dysfunctions are caused by specific nutritional needs, sometimes difficult to identify. Consuming Moringa regularly helps fill gaps and provide your body with all the elements necessary to maintain iron health. Should I try Moringa with seeds ? Pills ? Powder ? And why ? How many seeds or other Moringa product should I take ? Can I use Moringa every day ? Is there anything I need to know before starting Moringa ? 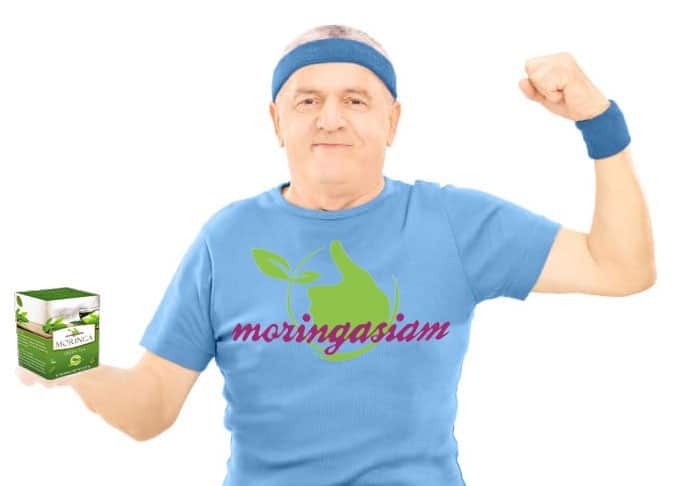 Moringasiam beginner's guide will teach you everything you need to know to get started with Moringa. Thousand of readers already love it, so will you ! Why is Moringa Oleifera so beneficial? And how to choose it well? If Moringa is also beneficial for your body, it is because it has an incredible amount of vitamins, nutrients, and other elements essential to the proper functioning of the body, such as calcium, potassium, or amino acids. To better understand this, the image opposite shows you the comparison of the nutritional values of Moringa Oleifera with more common foods. 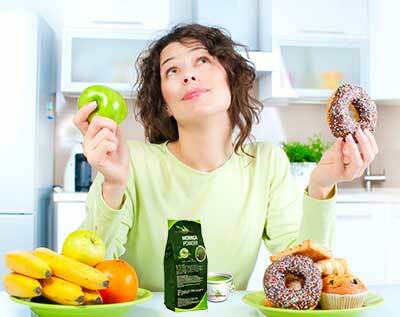 Ensure that the products are not mixed with other products and that they contain 100% Moringa. 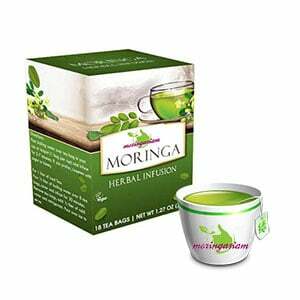 Of course, there may be Moringa products, such as our Moringa green tea, or our balm, embellished with Thai herbs. Our powder or capsules consist of 100% Moringa without any added products. Check the origin of your Moringa. Is it a recognized farm? Does it certify its products 100% natural? Located in an area free of pollution near the mountains, our farm guarantees 100% natural agriculture throughout the production cycle, from seed to finished product. The Moringa must be contained in a special packaging in order to preserve all its virtues. A non-airtight or light-proof packaging has a direct impact on the preservation of the vitamins of your Moringa. Our products are hermetically sealed to offer you a Moringa of the best quality possible. When it comes to leaves, you need to know about the drying method used. 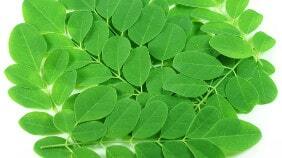 Studies have shown that drying methods of Moringa have a direct impact on leaf nutritional values. A verification is therefore necessary, to make the best possible benefit of your tree of life. Our drying process follows the best methods, used and recognized for hundreds of years. For thousands of years, Moringa Oleifera has been an essential element in Ayurveda, traditional Indian medicine, which uses it to treat over 300 diseases. Moringa grows quickly in dry and arid areas, so it can feed populations suffering from malnutrition. 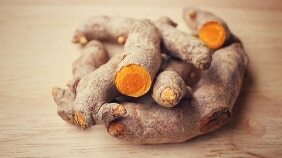 Anti inflammatory, anti cancer and anti diabetes, for several years it has been fashionable in other parts of the world, particularly in the West and in developed countries, where its essential elements, such as amino acids, vitamins and antioxidants, are now acknowledged. In Ayurveda, Moringa is used to treat 300 diseases. Example of treated or prevented diseases by Moringa (based on “The wealth of India”). Leaves Diabetes, cancer, taste, wounds, headaches, fever, sore throat, bronchitis, eye and ear infection, etc. Flower Aphrodisiac, anti-inflammatory, hysteria, tumors, cholesterol, enlargement of the spleen, etc. Seeds Decreases lipid peroxidation, antihypertensive, etc. Roots Anti inflammatory, laxative, cardiac and circulatory stimulant, anti rheumatism, reduces joint and back pain, etc. Bark Eye diseases, treatment of patients with delusions, enlargement of the spleen, anti tumor and anti ulcers, ear care, dental pain, etc. Free radicals are responsible for the damage and destruction of cells in our body as we age. This has many consequences, including cardiovascular disease, and lowered immune system and energy levels. Antioxidants play an important role in protection. Free radicals appear when there is oxygen combustion within a cell. Physically speaking, there is an atom with a free electron which is looking for other electrons. When there are many atoms in search of electrons it is called oxidation. It is at this point that antioxidants, such as those in Moringa, intervene: they give the free radical an electron. Of course, the body creates its own antioxidants. However, pollution, pesticides, smoking, and the many other harmful products in our daily lives, increase the number of free radicals, leaving the body weakened. Moringa’s antioxidant capabilities are greater than those in the vast majority of food. Green tea, garlic, and red wine, also have good antioxidant capacities, but less than Moringa. Antioxidants help prevent deterioration of body cells, caused by the oxidation process. Moringa is also effective against the proliferation of cancer cells. Studies have shown that the leaves of the tree of life could have anti cancer properties, and particularly for breast cancer. Because when cells are altered by the process of oxidation, tumors can appear, and spread to neighboring cells as they proliferate rapidly. Antioxidants help keep cells healthy by fighting against free radicals, and the zeatin contained in Moringa accelerates cell regeneration. A study carried out on albino rats indicates that an extract of the leaves of Moringa Oleifera can be a potential treatment for diabetes. Researchers fed the leaf extract to rats with diabetes while monitoring their blood glucose levels, glutathione, and other relevant indications for the disease. At the end of the study, the rats fed Moringa had a considerably lower blood glucose level with a blood sugar level divided by two and a half. Glutathione levels also increased from 20% to over 70% in rats fed Moringa: it is a powerful antioxidant in the prevention of heart or respiratory problems, which diabetics can face. Zeatin is a plant hormone, which is commonly found in the roots of Moringa. It is from the family of cytokinins which are involved in cell renewal and the slowing down of aging. Cytokinin divides cells before they become too large. So, when cells divide faster than the older ones die (about 30,000 per minute), the skin becomes less wrinkled, smoother and revitalized. Pakistani researchers showed that Moringa extract was able to revitalize the skin and reduce signs of aging. Subjects, aged between 20 and 35 years, applied a cream made from Moringa on their face twice a day for 3 months. Significant results emerged after two months, with a reduction of micro-wrinkles anti-aging effect of Moringa after 3 months. The effect of the cream used during the study, before (picture A) and after (picture B) use of the cream. Studies on breastfeeding showed that women who consumed Moringa leaves produced twice as much milk as those who did not consume them. Breast milk is essential for the growth of infants, so the consumption of Moringa by breastfeeding women is also beneficial for the child. When a woman is pregnant, more than ever, she needs to eat healthily, for the sake of her own body and that of her child. Her need for protein, iron, and calcium is increased. Women have babies with higher weights registered at birth and better health. Women’s breastmilk production has increased. Women taking Moringa during pregnancy should be subject to study and medical opinion. Studies performed on rats have actually shown certain cases of infertility and thus recommend taking Moringa only after conception. For a long time, Indian medicine has been prescribing Moringa for sexual problems. It aids sexual endurance and increases libido. For the man, it is also a stimulant that helps with erection problems. It is common to use the properties of certain plants to increase male fertility or sexual desire. Moringa does not escape this rule considering its interesting nutritional value. Nowadays, infertility is a problem connected to several factors, among which is low sperm quality. We are faced with different pollutants, toxins, and vitamin deficiencies, which are factors to this low quality, that Moringa could remedy. A study by the science academy showed a correlation between Moringa seed consumption and sexual function improvement in male albino rats. Studies have shown that Moringa leaves generate powerful antimicrobial activity on several bacteria such as Bacillus Cereus and Mycobacterium Phlei. It’s not uncommon for antimicrobial properties to be present in plants. A large part of the world population turns to plants for their antiseptic and antibacterial virtues to fight infectious diseases. Moringa is efficient against germs. It’s been proven that it can be more efficient than certain antibiotics with certain bacteria, and studies predict its use as the basis for new antibiotics. Moringa powder and its antimicrobial properties can be used to wash your hands. One study demonstrated the in vitro (and not in vitro) effects of Moringa leaves’ anti-pathogenic action. 15 volunteers had their hands artificially contaminated with the Escherichia Coli bacteria. They washed their hands, one group with a reference soap following European regulations, and the other using Moringa powder. There was no difference with the reference soap using more than 4 grams of Moringa powder. This study showed that Moringa can be used in developing countries where pathogenic agents circulate from hand to hand. Click here to see the details of this study. More than one billion people don’t have access to clean water, and 2 million people die each year from unclean water, most of them children under 5 years old. After the oil has been extracted from Moringa seeds, the residue of the latter can be used to treat the water. It’s acknowledged that the seeds can be more efficient than current chemical treatments. This property of the tree of life is a blessing for multiple regions without clean water, where it is necessary to purify the water before drinking. 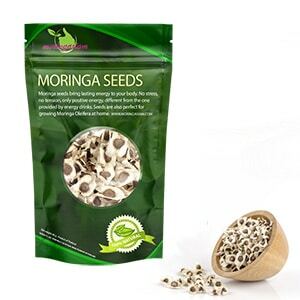 Moringa seeds are more efficient when they are gathered in dry seasons because they contain active components. Two trees would be sufficient to purify the water of a family of 5, if the turbidity level is medium. Moringa Stenopetala is more efficient than Moringa Oleifera for water purification. 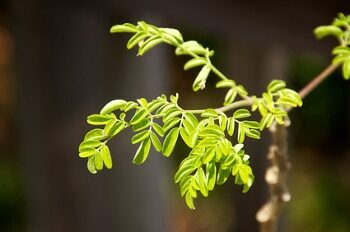 Moringa Oleifera is a plant that loves the sun and heat: it grows well in dry regions, which allows for cultivation without costly irrigation techniques. The soil’s pH levels should ideally be between 5 and 9, at an altitude between 0 and 2000 meters. The optimal rain level is between 250 and 3000 mm. Moringa Oleifera is a tree from the Southern Himalaya region and the northwest of India. It’s a resistant tree quickly growing in tropical and subtropical regions of the world. It can reach a height of 10 to 12 meters and a diameter of 45 cm. India is the largest producer of Moringhem, with an annual production of 1 to 1.3 million tons of the fruit. It’s also quite common in Thailand, the Philippines and Indonesia. It can also be found in Central America, the Caribbean, South America, Africa, in Southeast Asia and Oceania (sources). The first fruits can be harvested 6 to 8 months after planting. Often, it is delayed to the second or third year to increase production. For example, after 2 years, Moringa Oleifera can produce 300 fruits, compared to 400 to 500 after 3 years. On a well-kept tree, it’s possible to expect even 1000. Fruits can appear once or twice a year depending on the region where the Moringa is grown (sources available here). The leaves are harvested mainly during rainy seasons, with an average of more than a ton per hectare compared to 700 kgs during dry seasons. 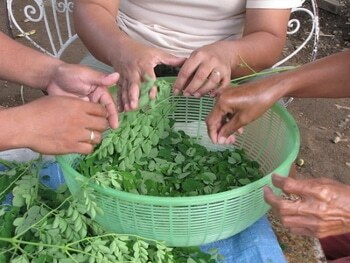 Moringa leaves can be harvested 2 months after planting. Generally, trees are cut to 60 cm from the ground after each harvest. The oil yield is estimated at an average of 250 liters per hectare. The latter is obtained after cold pressing the seeds, a technique used to preserve all the nutritional aspects of Moringa. The oil can be used as a dietary supplement or as the base for certain cosmetics, balms and creams, as well as for hair and skin care. Moringa leaves are the most nutritional part of the tree. They are a significant source of Vitamin A, Vitamin D, Vitamin C, Vitamin K, protein, Manganese, Calcium, Potassium and essential nutrients. sauces, or to make capsules for swallowing. 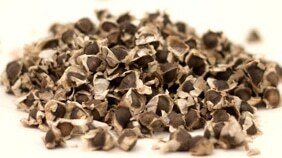 Moringa seeds contain a lot of Vitamin C, Vitamin D and minerals. They can be eaten after being peeled or grilled. Moringa seed residue after oil extraction can be used to filter water for human and animal consumption because it contains proteins that absorb and neutralize impurities in the water. Moringa oil, also called Ben oil thanks to its strong concentration in Behenic acid, obtained through Moringa seeds. The best process is cold extraction, where the seeds do not exceed a temperature of 50° during manufacture. This makes it possible to preserve all the properties of the oil, and in particular its anti-aging, antiseptic and anti-inflammatory properties. Moringa roots, once ground, can be used as a condiment high in polyphenols. They are used, especially in Senegal, against fevers, rheumatism and other joint pains. The table below summarizes the nutritional value of 100 grams of Moringa leaf powder. Here is the vitamin content (milligrams) per 100 grams of Moringa powder. The human organism requires essential amino acids in order to function properly. Unlike their non-essential counterparts, these acids cannot be synthesised by the human body and must therefore be provided by food. Moringa oleifera contains 18 amino acids in total. It provides all the essential amino acids the human body requires. Phenylalanine, which enables nerve cells to communicate, improves memory and increases vitality. Leucine, which in conjunction with isoleucine increases alertness and maintains the body’s energy levels. Methionine protects the kidneys and keeps the nails, skin and hair in good condition. It also protects the liver and reduces cholesterol. Lysine enables the production of collagen and helps the bones absorb calcium. It also regulates the hormones, helps with the production of antibodies and maintains the balance of nutrients. Isoleucine maintains brain health and body energy levels. Valine enables the mind to relax and helps to coordinate the body’s various movements. Threonine prevents fat accumulating in the liver. It also plays a useful role in digestion and facilitates intestinal transit. Tryptophan strengthens the immune system, prevents insomnia, and may play a role in reducing migraine. It also helps to reduce bad cholesterol and can help prevent heart attacks. Histidine is used to regulate the body’s allergic reactions. It also enables the production of red and white blood cells, as well as protecting the nerves. Vitamin A, which contributes to bone growth and helps to strengthen the immune system, the skin and the mucous membranes. Vitamin B1, which converts food into energy and enables nerve communication, thus playing a role in the memorizing process. Vitamin B2, which converts carbohydrates to energy and also neutralizes free radicals. Vitamin B3, which plays an important role in reducing cholesterol, in the function of the brain and in converting food to energy. Vitamin B6, which is responsible for hormone and red blood cell production, as well as strengthening the immune system. It also ensures the transmission of neuronal messages. 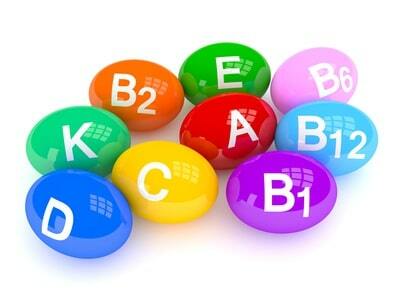 Vitamin B7, which maintains the metabolism and the body’s tissues, as well as preventing heart problems. Vitamin C, which plays an essential role in strengthening the immune system, as well as limiting the amount of free radicals produced. Vitamin D, which is essential for healthy bones and teeth. Vitamin E, which as well as protecting the membranes of the skin cells, also protects red blood cells against oxidization. It additionally prevents the formation of blood clots. Vitamin K, which plays a role in cardiovascular health, cell growth and blood clotting. How are moringa leaves consumed? It is advisable to eat the leaves fairly soon after picking. They can lose some of their vitamin content if left for an extended period. As for the preparation itself, just a quick few minutes cooking time is all that’s required, as this avoids degrading their nutritional value. Though cooking does reduce the vitamin content, it compensates for this by making the nutrients easier for the body to absorb. Also bear in mind that it is perfectly possible to combine moringa with other ingredients. Boiling the leaves does, however, increase the bioavailability of the nutrients several fold, especially in the case of iron. According to a study carried out by http://avrdc.org/, boiling moringa leaves multiplies the bioavailability of the iron by a factor of three and a half. When boiling the leaves, it is a good idea not to throw the water away as certain vitamins, such as B and C, are soluble in water, which means they can be retrieved from the water you use for cooking. So in order to get the benefit of these vitamins, add this water to the dish you are preparing, or use it in a sauce. 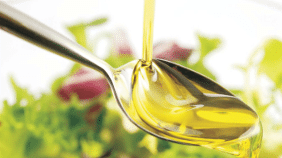 Other vitamins, by contrast, (A and E for example) are soluble in oil, which makes it possible to extract them by cooking the leaves in fatty substances. When opting to cook the leaves, the best way to do it is by steaming, which results in less vitamin C being lost. The leaves can also be consumed raw if they are still young. 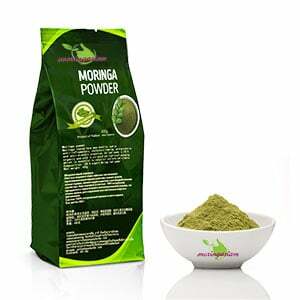 of moringa to all kinds of dishes, sauces, desserts, drinks, etc. It is important to note that when converted to a powder, the leaves lose a significant portion of their vitamin content. They do retain most of their nutrients however. The amount of vitamins and nutrients provided varies depending on the method of consumption. The leaves have been observed to contain measurably less nutrients when reduced to a powder. 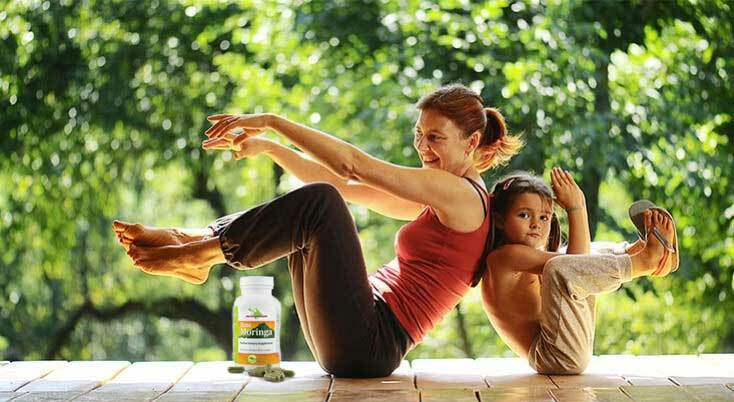 – Moringa leaves provide 80 to 100% of the daily calcium requirements for children under three. The figure varies between 30 and 50% for young adults and adults respectively. One hundred grams of moringa leaves is enough to cover 100% of the daily requirements of vitamin A. The vitamin A content of moringa leaves can vary significantly depending on the production method used and how they are stored. Light and heat, for example, are important factors. Furthermore, moringa leaves have a limited shelf life in terms of the maximum benefits they can provide. The same is true of vitamin C: moringa provides enough to cover the daily requirement (which ranges from 60 to 130 milligrams per day). 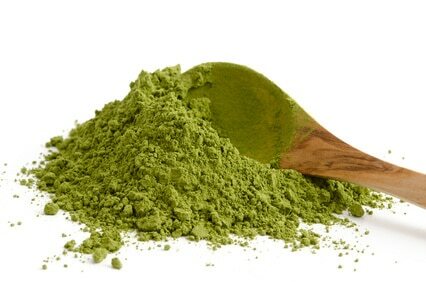 When purchasing moringa powder, it is essential to check that the container or packaging used is of high quality: it needs to be airtight and provide protection from light. This enables the vitamin content to be preserved. Powder is best consumed within six months, as once this amount of time has passed the nutrients it contains (minerals for example) can begin to degrade. One glance at the interest curve for Moringa oleifera shows us that its popularity is growing exponentially. As with all products in vogue, once you decide to consume it you need to ensure it is of high quality. The quality of moringa production is of course directly related to the benefits it provides when consumed. The vitamin and nutrient content is higher when the farming method used is very strict, as much in terms of checks and controls as the environment and the methods employed. So whether you opt for capsules, powdered leaves, or tea, you need to ensure a completely organic form of farming has been used, with absolutely no chemical products or pesticides involved: these things are harmful to both your body and the environment. Very attractive prices can of course sometimes be a factor, but be careful to pay attention to the methods employed. So to avoid the plant losing its nutritional value during the production process, an informed approach is required. At Moringasiam, the oil we supply is extracted by means of a cold pressing process. The temperature involved never exceeds 50°C, which enables all the oil’s virtues to be retained. Some producers and dealers may blend moringa oil with other types of oil to increase their margins, to cite one example. The reasons moringa oil is around 20 times more expensive than standard vegetable oil are that the processes involved in its extraction are more costly and a remarkably large amount of seeds is required to produce just one litre of oil.